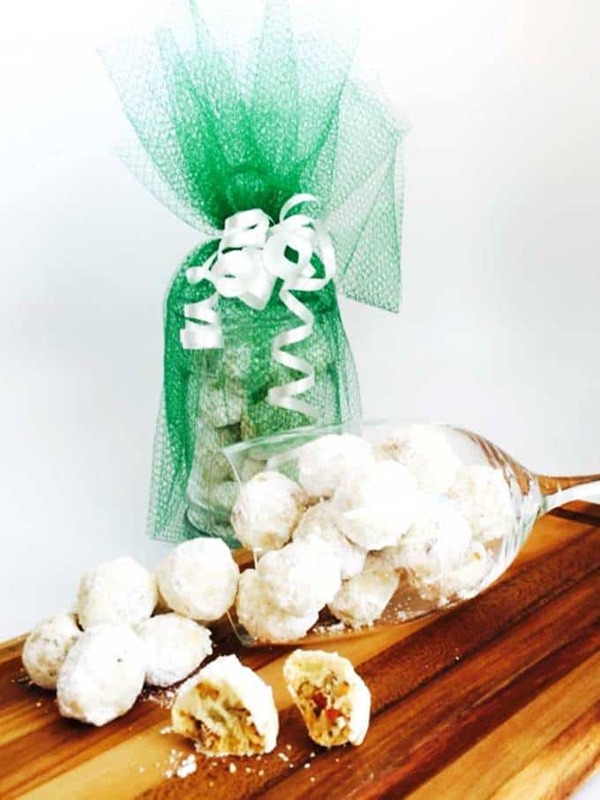 Packed with a toasted pecans and dusted with confectioners’ sugar, these buttery Toasted Pecan Snowball Cookies are a family favorite at Christmas. They are the perfect edible gifts for your loved ones during the holiday season. When I was a kid, my mother needed Christmas presents to give to her co-workers. I volunteered to make the presents. I decided that I would try to marry my favorite cookie with something appropriate for a Christmas. My favorite cookie for all of these years is Toasted Pecan Snowball Cookies! I decided to fill decorative jars with these delicious bite-sized cookies. I then wrapped the jars in nylon net, and tied the nylon net with some sort of ribbon. From what I remember, they were a huge hit. The cookies not only looked really festive, but also were incredibly good! 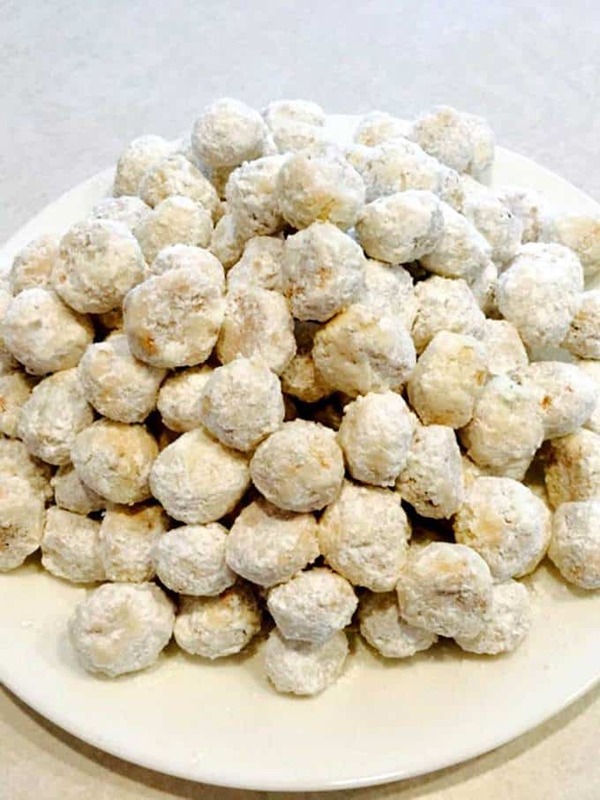 My recipe for Toasted Pecan Snowball Cookies is actually a variation of a recipe for pecan sandies. I seem to remember copying the recipe from a cookbook while I was babysitting. 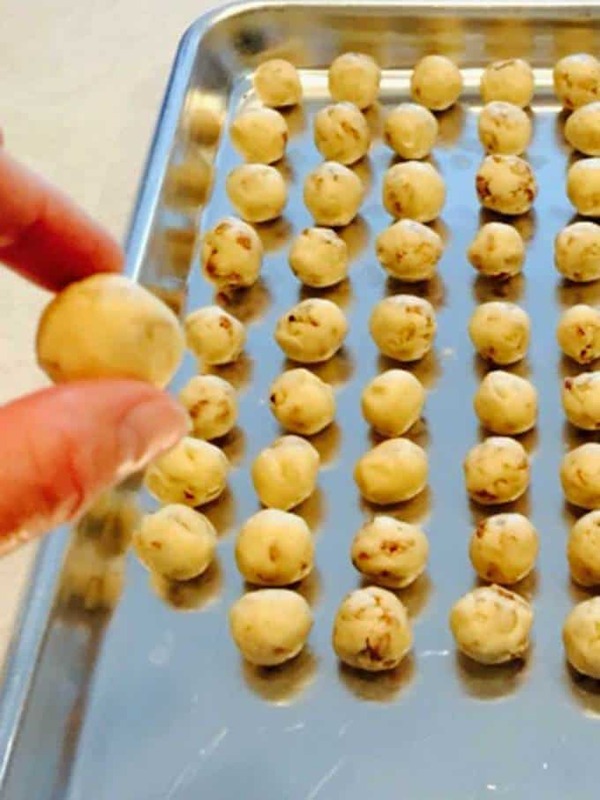 From day one, I made the Toasted Pecan Snowball Cookies as tiny as I could manage. The reason was to produce a little taste of heaven as each one was popped into my mouth. 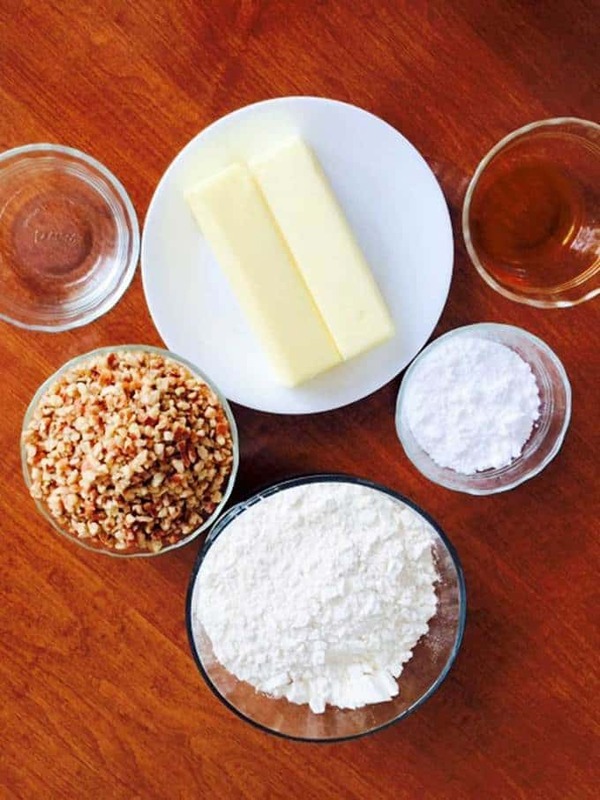 I used the following ingredients: Unsalted butter, confectioners’ sugar, vanilla extract, water, all purpose flour and toasted chopped pecans. It’s important here to use unsalted butter. One time I made the mistake of using salted butter, and the salt dominated the taste. For the first step, I creamed room temperature unsalted butter with an electric mixer. Then, I added the confectioners’ sugar, and beat the mixture on high until it was light and fluffy. To this mixture I added the vanilla extract and water, and beat until well combined. Then, I added the flour and mixed on low speed until everything was well combined. At this point, I gave the dough a quick mix with a wooden spoon to ensure that all of the flour had been incorporated. Finally, I added the toasted pecans and mixed well with a wooden spoon. Once everything was well combined, I began the tedious process of rolling the dough into very small balls. I made sure that they were no larger in diameter than a penny. I placed the little balls on an ungreased baking sheet. Because the cookies expanded very little during cooking, I put the balls very close together. I baked the cookies in a preheated 350° F oven for about 25 minutes until they were golden brown. When I removed the cookies from the oven, I immediately transferred them to a 9×12-inch pan and covered them with confectioners’ sugar. I tossed the cookies to coat, and transferred the coated balls to a plate. Once all of the cookies had been coated with confectioners’ sugar, I repeated the process. Because the cookies were hot during the first coating, the confectioners’ sugar melted just a bit. This allowed the confectioners’ sugar from the second coating to adhere very nicely to the cookies. 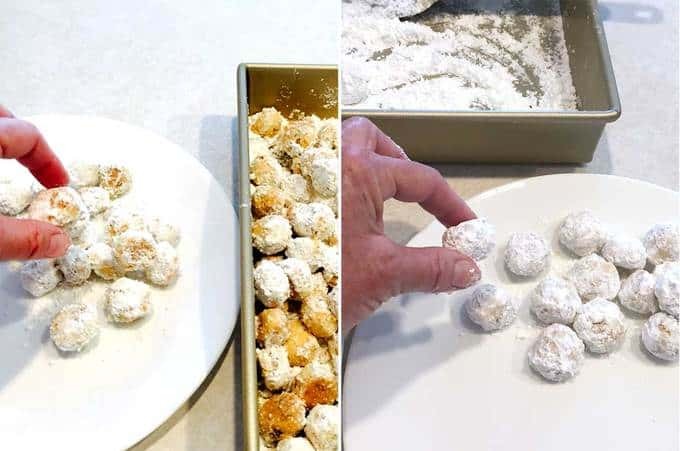 Although it was somewhat of a tedious process to roll the dough into such small balls and then double coat them with confectioners’ sugar, it was well worth it. I actually think that the cookies are better the next day, if that’s possible. 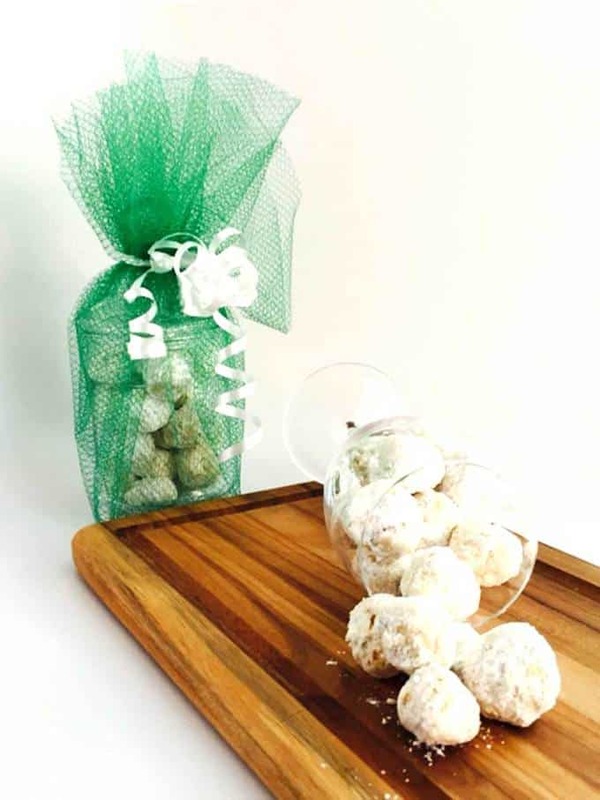 The Toasted Pecan Snowball Cookies stay fresh for a week when packaged in an airtight container. They make the perfect edible gift for the holiday season, and are the perfect size to pop into your mouth. Yum! In a large bowl, beat butter until creamy. Add ⅓ cup confectioners sugar and beat until fluffy. Add vanilla extract and water; blend well. 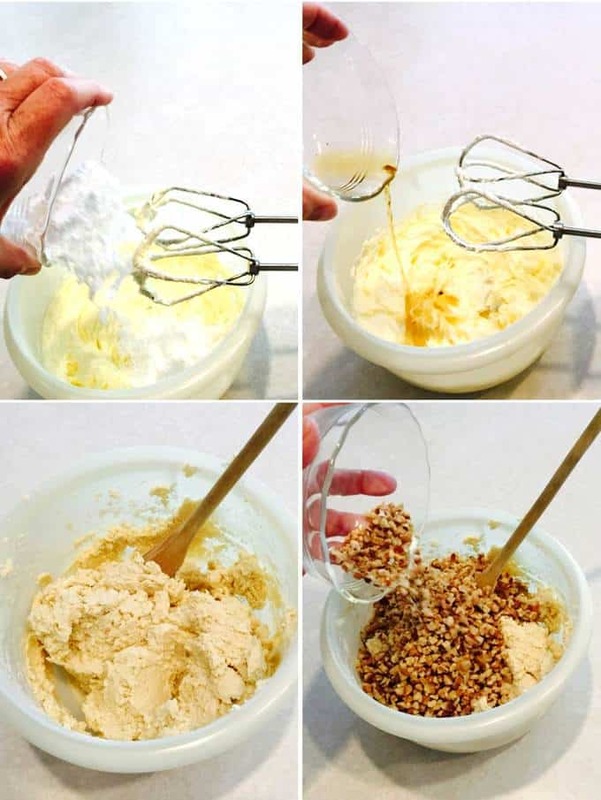 Add flour and stir until well blended. Stir in pecans. 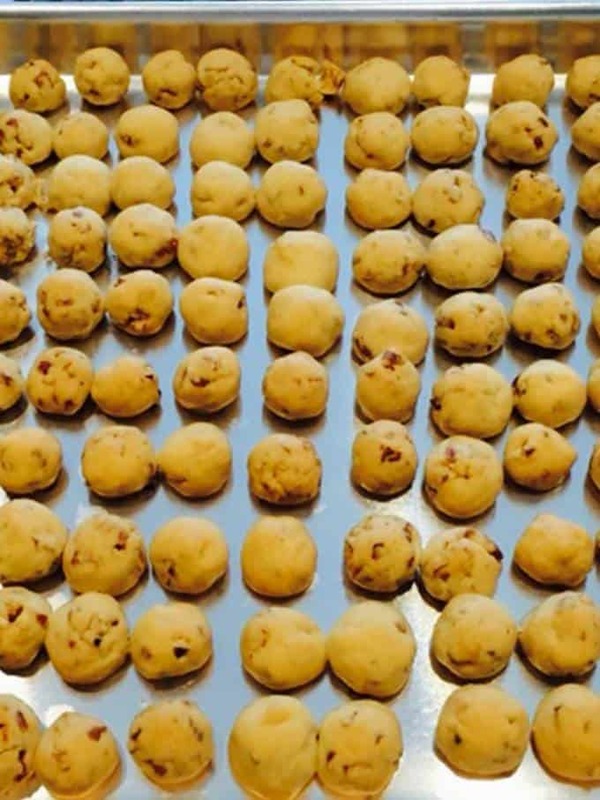 Form into small balls (no larger than the diameter of a penny - the smaller the balls, the better the cookies). Place on an ungreased cookie sheet. Bake for 25 minutes or until golden brown. Remove from the oven and immediately roll in confectioners' sugar. When all cookies have been rolled in confectioners' sugar, roll the cookies again in confectioners 'sugar. Store in an airtight container (I use a ziploc bag). Yield: 13 to 14 dozen.